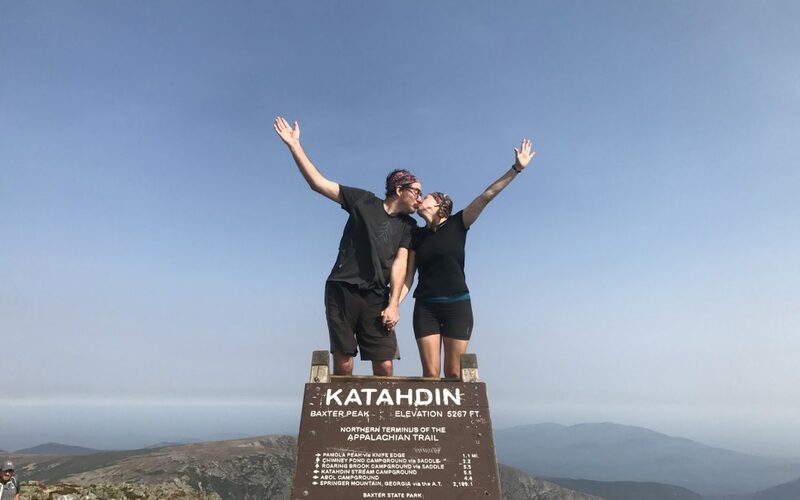 Day 179 – Summit Day! You guys… we did it!! KatahDONE!! Wow – what a beautiful, breathtaking, hard, courageous adventure. Thank you ALL for following and supporting us with your positive comments and vibes – you helped us more than you know!! Day 173 (Sep. 10th) – 14.3 miles – start of 100 mile wilderness! Had amazing breakfast at Shaw’s, and got to trail by 8:45. Hard, hard day with countless PUD’s (pointless ups and downs), major roots, rocks and mud. Steep downhills. We hurt (knees and feet)! Camped at a stealth spot by river – sounds beautiful. Day 174 (Sep. 11th) – 11.7 miles to Chairback Gap Lean-to. We feel like we’re in the White’s again! Super hard day. Climbed 5 mountains. Exhausted. We hit 2,100 miles today!! 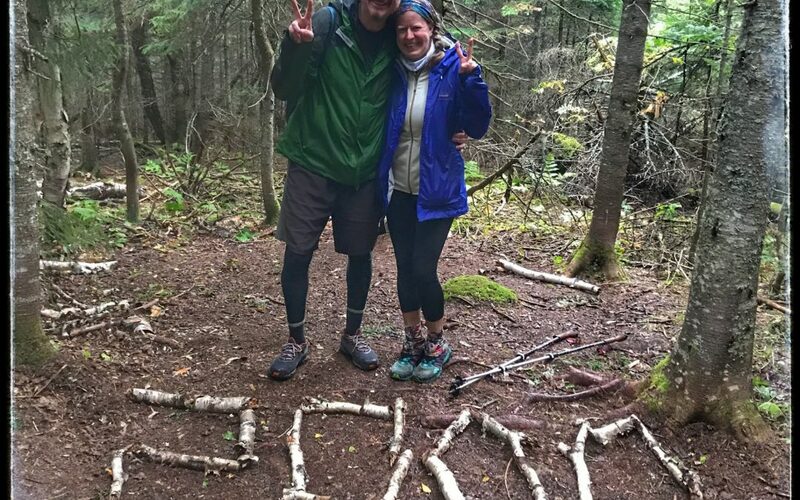 Day 175 (Sep. 12th) – 17.1 miles to Logan Brook Lean-to. 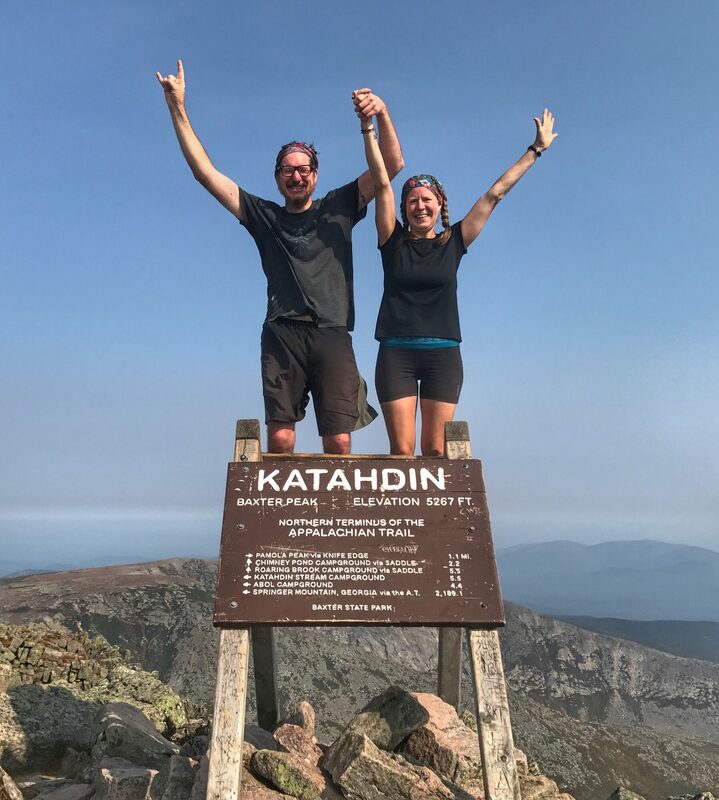 Hard day but we feel good about it – did 5 mountains and got our first glimpse of Katahdin! Day 176 (Sep. 13th) Day 4 in the Wilderness – 23.1 miles to Potaywadjo Spring Lean-to. Excellent weather and mostly great terrain. We had trail magic today(!) – total surprise and was amazing (we’ve been pretty hungry out here in the wilderness, probably should have packed more food) – they had a stove and served breakfast tacos, coffee and then spaghetti and meatballs! Still hard day with the long miles. Day 177 (Sep. 14th) Day 5 in the Wilderness – 22.0 miles to Rainbow Lake Campsite. Hard day today (some hills, lots of roots and rocks and mud bogs, plus just a lot of miles). 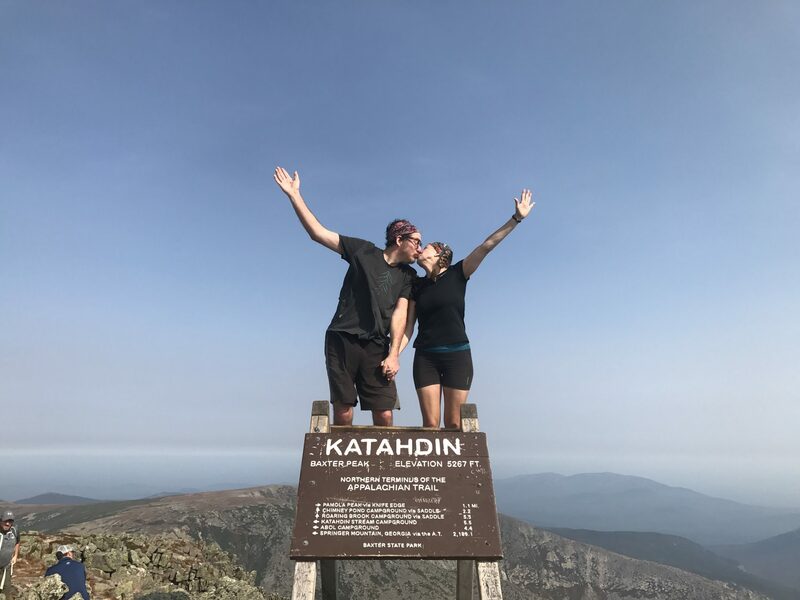 Tomorrow we finish the 100 Mile Wilderness and get to the base of Katahdin!! Day 178 (Sep. 15th) Day 6 in the Wilderness – 21.1 miles. We made it out of the Wilderness 11 miles into our day, and it was great because there was a restaurant right there! 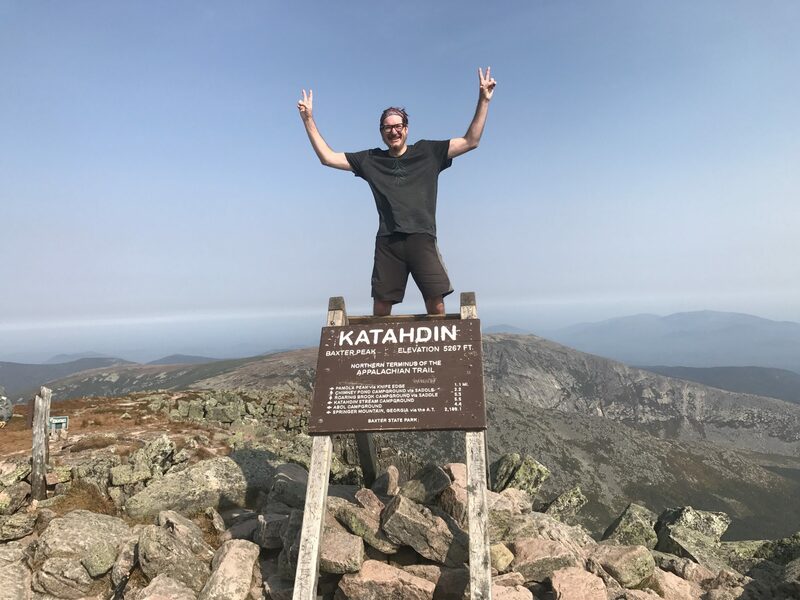 We chowed down on burgers ?, then resupplied for rest of the day and tomorrow, and then hiked 10 more miles which brought us to Katahdin Stream and The Birches at the base of Katahdin. We checked in with the Ranger Station and got our permits for tomorrow. We are ready to summit big K tomorrow!! Day 170 (Sep. 7th) – O miles / zero day. Much needed day off. Will head out tomorrow (rain in pm expected) and be to Monson by Saturday night (more rain on Sat). Will stay at Shaw’s in Monson, resupply, and then hope to start the 100 Mile Wilderness. Day 171 (Sep. 8th) – 18.8 miles to Moxie Bald Mountain Lean-to. Hard day, two mountains, but great weather (rain held off and it was cool but not too cold). We saw a moose today in the woods! It was through a lot of trees, so we could really only see it’s shape – it had antlers and was huge. Day 172 (Sep. 9th) – 17.9 miles to Monson, staying at Shaw’s. Nice day today and pretty good terrain (well except for all those nasty roots, rocks, and water crossings!). We had to ford our first two rivers today! Tomorrow we enter the 100 mile wilderness and will be out of pocket (no cell coverage) till we reach Katahdin! Wish us luck! Day 162 (Aug. 30th) – 10.1 miles to South Arm Road, slackpacked again. This guy, Jim, drove all the way fro Rhode Island to meet and hike with us today! What a great guy, he’s a helicopter pilot and enjoys skydiving. Such a pleasure to meet you, Jim, and wish we could have spent more time with you! And we met a SOBO Hiker today with the same trail name as me – Chica! Good day and I’m feeling better. Day 163 (Aug. 31st) – 13.2 miles to ME 17. It was cold, windy, misty/rainy, root-y, and rocky today. We had trail magic today, from a nice guy named Snowman. 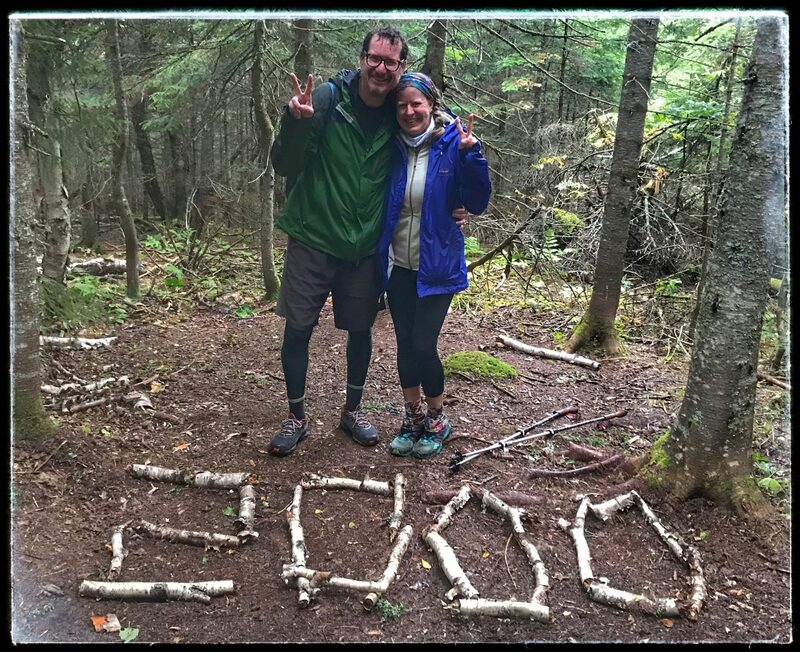 Day 164 (Sep. 1st) – 13.2 miles to ME 4, Rangeley, ME. It was SO cold today! High was 48, and I wish I knew what the wind chill was – it was extremely windy and cold, I could not warm up all day. The locals tell us it is unseasonable to be this cold so early in the fall, but here we are. Nice easy hike today – terrain was really nice (meaning very root-y and some climbing, but not too much elevation gain which was nice!). Day 165 (Sep. 2nd) – 14.8 miles. We conquered three mountains today – Saddleback Jr., Horn and Saddleback Mountain. And we saw a moose!!!! Very exciting. Weather was great today. Day 166 (Sep. 3rd) – 17.4 miles. Cold, windy, rainy day. But none of that matters, because we hit the 2,000 mile marker, you guys!!! Day 167 (Sep. 4th) – 16.7 miles in the Bigelow Mountain range today. Hard day. Climbed Little Bigelow, Bigelow Avery, Bigelow West Peak and South Horn. The Bigelows are the last 4,000 foot mountains until Katahdin. Staying at Stratton Motel tonight, sharing a room with Pappa John. Day 168 (Sep. 5th) – 16.7 miles to Harrison’s Pierce Pond Camps. What a great day today! We flew over the 16.7 miles in under 6.5 hours. The terrain was so great! I mean, yes, there were (lots of) large roots and some big rocks and mud bogs, but there was hardly any elevation gain or loss – which was a very beautiful thing, especially after yesterday. Tim Harrison has a cool place here on the lake (I mean pond), we have our own spacious cabin with a gas lamp. And they have a flushing toilet and hot water shower! The price ($40) includes a 12-pancake breakfast tomorrow morning, can’t wait. Day 169 (Sep. 6th) – 3.6 miles to Caratuck, Maine. What a lovely breakfast we had at Harrison’s this morning! Then short rainy hike to the Kennebec River where the AT provides a canoe ride for hikers to cross over (too deep and raging at times for hikers to cross), then into Caratuck. We are at Sterling Inn and thinking about zeroing tomorrow as rain is forecast all day. Day 154 ( Aug. 22nd) – 8.0 miles to Mt. Hight stealth camping spot. Our friend Alyson hiked with us today up to Wildcat D (one of the 4 Wildcat mountains we did today)! The signs we’re holding mean this is Alyson’s 7th 4,000 ft mountain in NH and our 12th (isn’t she cute that she made these signs for us?). Rain and hail forecasted for today but it never came! Day 155 (Aug. 23rd) – 13.1 miles to Gorham, NH. We are officially done with the White’s!! And we are just below 300 miles left (298.3 to be exact). Everything hurts. It was 13 hard miles today. Day 157 (Aug. 25th) – 11.8 miles to Gentian Pond Campsite. We hit the 1900 mile marker today you guys!! Pretty nice terrain (compared to White’s), but still some areas with climbing and difficulty. I was dragging today (have been fighting a cold). Chilly all day and cold tonight! 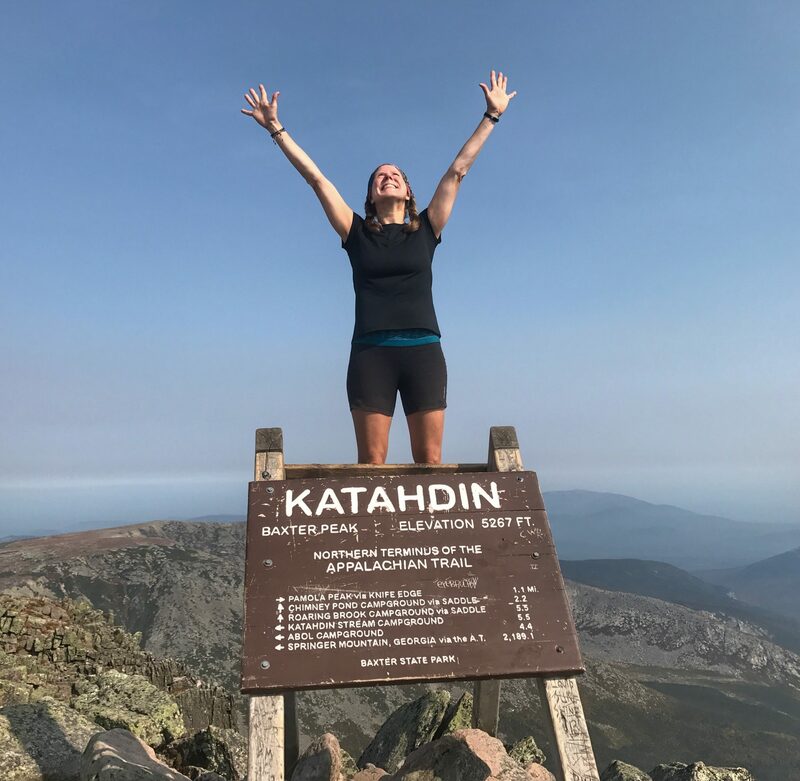 Day 158 Aug 26th – 9.6 miles to Full Goose Pond Shelter and Campsite. Hard, hard day. All boulder climbing (hand over hand) and steep ups and downs. Climbed 4 mountains today. Tomorrow – the Notch and Arm. I’m coming down with a cold, was dragging all day. Day 159 (Aug. 27th) – 5.1 miles to Speck Pond Shelter and Campsite. Mahoosic Notch and Mahoosic Arm = DONE! The Notch is classified as either the most difficult or most fun mile of the AT. It is a deranged field of huge boulders that you have to go over or under. It took us 1 and 1/2 hours. We classified it as surprisingly fun, except for the parts that were really scary. Think of playing Twister, but deciding on which boulder to jump to instead, with out falling down. Oh, to have a “normal” AT trail again (but I think those days are over). The “Arm” was also no joke with 1500 ft ascent in a mile. Hard day, and with me still not feeling well, we pulled up short today. Day 160 (Aug. 28th) – 4.6 miles to Grafton Notch, got picked up by shuttle and taken to Pine Ellis Lodging Hostel. Jen has a cold so did short day to town to get meds and rest. Day started with steep climb and some boulder scrambling (what’s new?) to the top of Speck Mountain, and then a nice gradual down to finish the day. Will slack pack tomorrow. Day 161 (Aug. 29th) – 10.3 miles to East B. Hill Rd. Slackpacked today, and it was a good day. Still have my cold but I was drugged up so felt better, and the terrain was not bad (compared to what we’ve been through lately!). Pretty steep climb at the top of Baldpate East Peak.